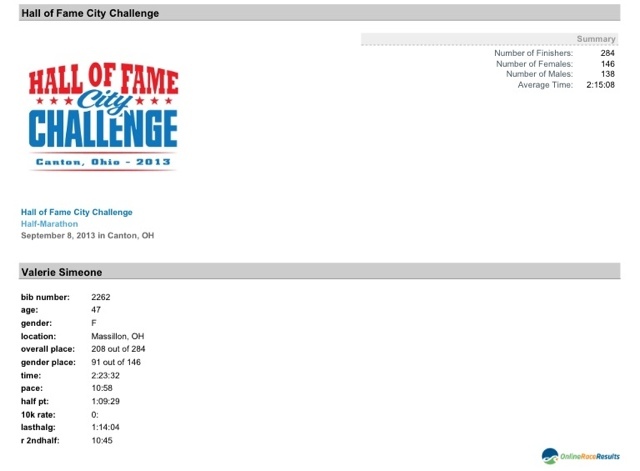 Well, the much maligned Hall of Fame City Challenge is in the books. Although the organizers billed it as being flatter than last year, there is no way that it was. The course was pretty brutal. It was early and dark and muggy to boot. Even though my time was not a new PR - it tied my current PR and with all things considered, I'll take it! However, ever since I've been home, my stomach is rebelling! Good thing I have had nothing else to do today except lay on the sofa and watch the Red Zone channel and follow my Fantasy Football teams! I am also packing for a training trip this week. I leave Tuesday for two days of training in Tulsa, Oklahoma and then spending the rest of the week and through the weekend with my daughter in Oklahoma City. I haven't seen her since the wedding in April (unless you count Facetme) so I'm very excited! Hopefully, we'll also get to run together! I hope you had a wonderful weekend and you have an enjoyable week ahead! Whew! I need a Holiday!